Sumer rentals Mid June till 2nd week of Sept.
Saturday to Saturday rentals in summer season. Fall and Spring partial weeks and weekends available please inquire through email. Must bring on sheets and towels . Sit on the deck look at the ocean and everyone up at the Nubble light house . The Cottage was very cozy and we really enjoyed staying there. The views are amazing. The only issue we had was the bathroom sink was leaking and we had to keep a cup under it to catch the drain water, so we couldn't use the bathroom sink the whole time we were there. We did let the owner know but a plumber could not make it out before we had to leave. We worked around it and just used the kitchen sink and still loved the place and hope to come back some time. We also felt like the location was very convenient to the towns close by. Easy to do the shops in Kittery, York, Ogunquit and Kittybunkport. Great cottage and great view of lighthouse. Owner was very accessible and provided quick responses with any questions we had. Truly enjoyed our stay and hope to return in the future. This cottage is beautiful and the views are amazing. Cottage is clean and neat. There were 5 ladies staying and we had plenty of room. We stayed on the deck a lot because the views are so spectacular! Just loved it! The cottage was so comfortably beachy, with a great view of the Nubble and all of its activity! We saw a wedding party having pictures taken and a lovely rainbow over the lighthouse. Everything was clean and neat; everything was there to make our stay enjoyable! We enjoyed good food in the area and the Ogunquit Playhouse. We loved it! Thank you so much Robert so glad you had a great time and hope to have you back again in the future. The photos do not do this little gem justice. Perfect in every way! Even with some rain! Great place to spend a few days.. the house is incredibly comfortable and you certainly can't beat the view! Thank you so much Cindie. We LOVE it there also I can't wait for this upcoming weekend its our time there !! Hope to have you back again. My wife and I just finished a week at the cottage. 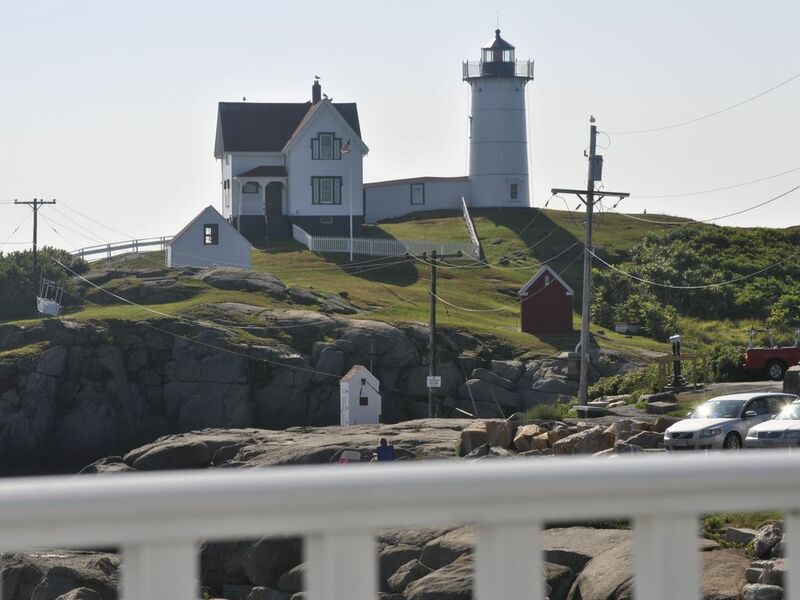 Perfect view of the Nubble Light. House is right on the water. Enjoyed watching the birds, seals and people around Nubble. The house is small but the space is well planned. Two bedrooms are a nice size. Bath is small but works. Kitchen and living area have great views with a wall of windows. Deck is right on the water. We hope to stay at the cottage again. Thanks Jamie for being the perfect host. Thank you Kermit for such a great review :) So glad you both had a nice time and loved the cottage as much as my family and I do . Hope to have you back again soon. Have a wonderful holiday !!!! Long Sands and Short Sand Beach, Dunnes Ice cream (use to be Browns Ice cream) , York Wild Animal Kingdom, Nubble Light House, Restaurants and Shops.